When Anna Emm quit her teaching job in 2002 to chase her dream of writing stories that would change the world, she had no idea where this path would ultimately take her. Today, AnnaEmm (Pty) Ltd is the largest producer of original children's stories in South Africa, and also one of the fastest growing companies. Its uniqueness and bold determination to âdo things differentlyâ are attributed to the woman who drives it. With the growing attention that Anna Emm is receiving, many people have started asking about âthe story behind the storiesâ... They are curious about Anna, about her journey, and about her love affair with words. Where has she come from? This is Anna's story in her own words. Sometimes referred to as âthe child whispererâ, she has a magical way with words, drawing you into each of her stories until your toes curl and your breath is suspended. This book is no different. As Anna takes you by the hand and leads you down the dark winding road of her troubled past and ultimately into the light, you will be forever changed. Be prepared for a remarkable story â and this time it is all true. And if this is your first introduction to this unique storyteller, you will understand why she is loved by children everywhere. 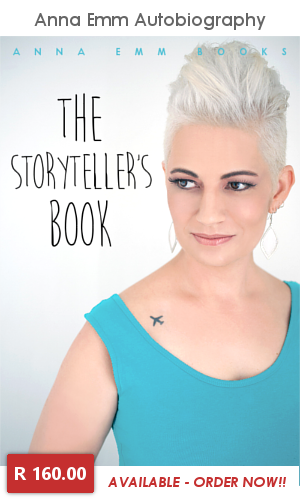 'The Storyteller's Book' is also available in AFRIKAANS a "Die Storieverteller se boek".